Quebec's dairy sector is and has always been the top agricultural sector in Quebec. Thanks to supply management and collective marketing, Quebec and Canadian processors enjoy guaranteed supply conditions, a fair price, and very high-quality milk. In fact, they negotiate with one sole representative and do not have to recruit producers one-by-one to obtain milk. They also benefit from equitable purchase conditions that include stable, predictable prices that are the same for everyone and a guaranteed supply of high-quality milk. They also have the option of acquiring milk to develop new niches. As concerns fluid milk, the provinces are autonomous and volumes are processed based on the demand of the population. That is why milk plants can be found in every province. The majority of fluid milk is produced in the most populated provinces, which are Ontario and Quebec, followed by the western provinces. In other words, Quebec plants organize their production to cover a portion of the needs of other provinces. Ontario and Quebec together produce 70% of milk. Following in the footsteps of other economic sectors, the dairy processing sector has become largely concentrated. For example, in 1965, there were 1,413 dairy processing establishments in Canada Nowadays, in Quebec and Canada, the dairy processing sector is dominated by three large companies: Agropur, a cooperative, Parmalat and Saputo, two private companies. In Quebec, they alone process close to 82% of the milk. The large Canadian dairy processors that publish their financial results, Agropur and Saputo in other words, post huge profits every year. The Canadian division of Parmalat, which is considered the most profitable division of the Italian multinational, passed unscathed through the crisis that hit its parent company in the early 2000s. Dairy processing activities have been reorganized in order to draw closer to the main markets: cities. This reorganization has left some regions without enough processors, which means that milk has to be transported longer distances to be processed before it returns to its region. The pooling of milk transportation costs allows producers in these regions to continue to produce milk without having to assume additional expenses since processing companies are no longer located in their regions. Despite the concentration of the processing sector, new small processing companies, including small artisanal cheese makers, emerge every year. As a result, Quebec is the only province where the number of processing companies is rising. At the other end of the spectrum, more than the half of the 93 dairy processing companies use a total of only 0.5% of the milk. These are producer-processors and small cheese production companies. A reserve of 5 million litres of milk is available to new companies that want to start up. This reserve has existed since 1993 and the volume of 5 million litres has always proved to be largely sufficient to cover the demand of new companies. In addition, as part of the Domestic Dairy Product Innovation Program (DDPIP) run on behalf of milk producers by the Canadian Dairy Commission, Quebec has processed the most milk used to produce new dairy products since the program began in 1990. This program was replaced on August 1, 2013 by the Dairy Innovation Program (DIP). It should be noted that this program was designed to provide dairy processors with continuous access to the milk they need to create innovative dairy products and stimulate demand for milk. New niches, such as organic milk production, have also emerged. 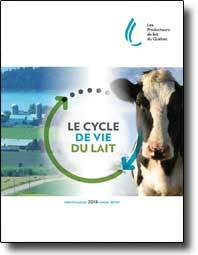 Les Producteurs de lait du Québec has been organizing special organic milk collection routes since 1993. Quebec now has 136 organic milk producers and is adding new producers on a regular basis. Their production makes the province the top organic milk producer in Canada. Organic milk production in Quebec went from 1.7 million litres in 1998 to close to 58 million litres in 2018. 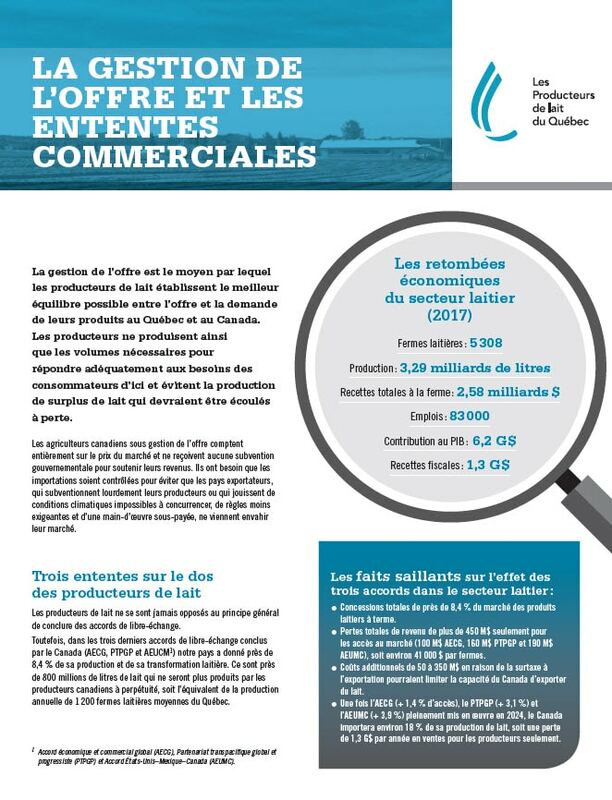 Omega 3 milk is also produced in Quebec and other types of production will probably be developed in the future. Today, Quebec is the leader in cheese production. It manufactures nearly 50% of all cheese, which affords it one of the most well-garnished cheese plates in the Americas, given the wide variety of more than 500 cow’s milk cheese.